I'm new to JAMA and need to produce a Requirements Document that is easy to follow and is ordered by its hierarchy. 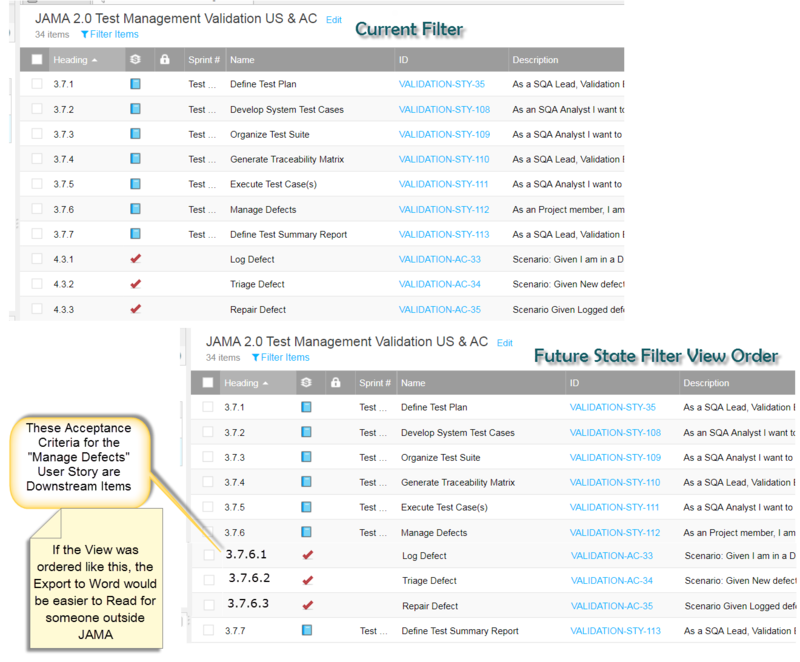 But in the view, I cannot change content in the "Heading" column so when the Word export is used, all of the User Story items appear first, followed by the Acceptance Criteria. This makes the export a difficult Requirements document to follow. I would like to export it by Parent, then children, etc.... format so that the User Story is followed by its downstream Acceptance Criteria. Is there a way to do this? I've looked through this forum and couldn't find a straightforward answer. If there is one, please point me in the right direction. I am assuming here that you are utilizing the default Export to Word functionality and that you are not making your own Custom Mail Merge Templates and/or BIRT and/or Velocity reports? And here is a link to the videos about Advanced Reporting and Office Exports. John, take a look at these links and let me know, I would start with the videos on Office Exports first!